The Banks Public Partnership is a working partnership between the City of Cincinnati and Hamilton County. Its team includes, and collaborates with, the private developer Carter/Dawson. The Partnership’s goal is to ensure timely, safe, efficient, and inclusive management of the public infrastructure portion of The Banks project. It will deliver the best value for public investment in the parking facilities, street grid, streetscape, and the public park. The development site is approximately 120 acres on Cincinnati’s Central Riverfront. Its boundaries are Third Street to the north; Central Avenue (west of Paul Brown Stadium) to the west; Broadway Street (east of Great American Ball Park) to the east; and the Ohio River to the south. The Banks area for residential and commercial development is 18 acres between the two major league stadia, Second Street, and the new park. 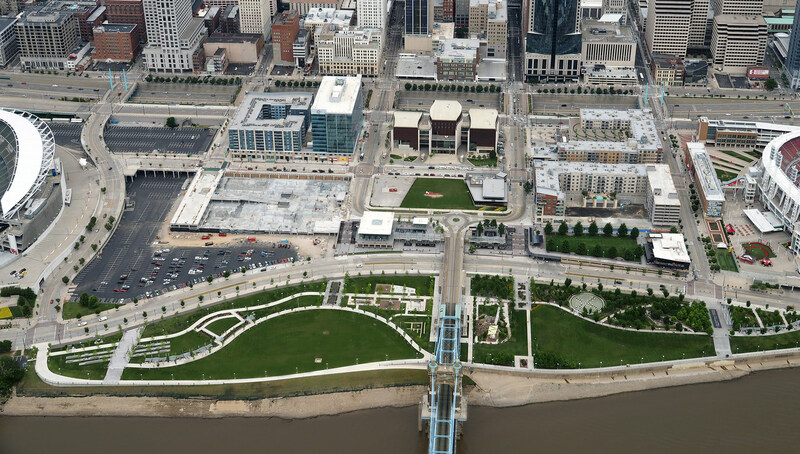 The Phyllis W. Smale Riverfront Park is located on 45 acres, extending from the Great American Ball Park to the Paul Brown Stadium and flanking the Suspension Bridge. Cincinnati Parks and the U.S. Army Corps of Engineers are overseeing the planning, development, and building of this multi-faceted park. Its Moerlein Lager House as well as the private development will be LEED-certified. With $128 million in local, county, regional, state and federal resources, The Banks Public Partnership will leverage $600-800 million of private investment. It is creating between 1,500 and 2,000 construction and permanent jobs, and it provides the public infrastructure necessary for transportation, residential, dining, recreation, entertainment, hotel, and office development. This $2.5 billion public/private urban development project will be a catalyst for regional growth. It will complete the revitalization of the downtown riverfront and create opportunities for tourism and economic development. The Cincinnati riverfront will be a welcoming front porch for the entire region. Cincinnati, its riverfront, and the Ohio River share a heritage filled with drama, action, a cast of interesting characters, and ebbs and flows in their mutual relationship with each other. Each is distinct from the other, but they are certainly interdependent. Even when the City or its residents turned away from the river, it continued to flow. For all its quirks, like freezing and flooding periodically, the Ohio River is the true ‘Main Street’ for Cincinnati—a major thoroughfare that has attracted and supported commerce, entertainment, recreation, wildlife, transportation, employment, art, and infrastructure for a very long time. The Banks Project represents the single biggest shift in thinking and developing the riverfront’s potential since the canal development started in the 1820s. The riverfront has served as the southern gateway for the State of Ohio and the Northern Midwest. The canals connected Cincinnati not only to the Great Lakes but completed the inland water system linking the Eastern United States with the Gulf of Mexico. Now Cincinnati has the opportunity to harness the energy, history, and sheer beauty of the Ohio River all over again. Several themes recur in the stories from the last 200+ years. The Ohio River has been unpredictable, varying in depth from fewer than 2 feet to 80 feet high. No planner or builder can control whether or not the river freezes, but engineers have reduced the variability of the river’s depth and navigability. The region has fared best when the connective properties of the river have been effectively harnessed. Farmers discovered a profitable new way to reap benefits from the corn crop, when the corn could also nourish the hogs traveling to market by boat. Like the canal system, trade by river could mean new customers for entrepreneurs. Even the settlement of Losantiville in 1788 relied on partners who were willing to assume considerable risks in order to build a community and support their families. In the 1970s the riverfront’s potential for fun brought appreciative audiences with athletic venues, fireworks, riverfront living, and parks. These developments ushered in an era of connecting the people of the region in a new way. Families started new traditions, like going annually to Riverfest, Black Family Reunion, Tall Stacks, or any of the festivals, concerts, or other events with the Ohio River as their backdrop. A new type of riverboat provided brunches, dinners, and cruises in a relaxed setting. With the culmination of The Banks Project and the redesigned Fort Washington Way, Cincinnati will welcome a new neighborhood to the riverfront. It will attract residents, customers, and tourists. It will complete the connection of the City grid and downtown to the Ohio River. No longer will visitors get lost trying to find their way to the river. The Banks Project offers easier access and visibility, and it can withstand the fickle nature of the river when it floods, a deterrent to past development. The public-private partnership is attracting a new era of investment. Soon, the Ohio riverfront in Cincinnati will be a destination like never before, fulfilling the promises of its lively past. 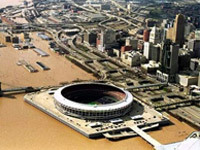 Click here for a History of Riverfront Development. Planning is at the heart of a successful development project. Archived here are the critical planning elements of the Cincinnati-Hamilton County central riverfront redevelopment, including The Banks. In 2013, The Cincinnati Central Riverfront Plan (with The Banks as its centerpiece) was honored by the American Planning Association with its National Planning Excellence Award. The links in the Planning Appendices below include economic impact studies conducted in 2012 (The Banks project overall) and in 2014 (GE Office Building). 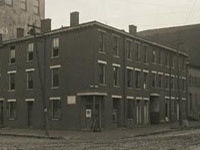 In addition, a May 2010 report highlights the archaeological investigation conducted to determine construction impact on archaeological deposits associated with the development site, uncovering artifacts (from buildings constructed in the early 1850s) at the northeast corner of Water and Race Streets. Today, the vision of The Banks is taking shape right before our eyes and the eyes of the world. People live where produce warehouses once stood. 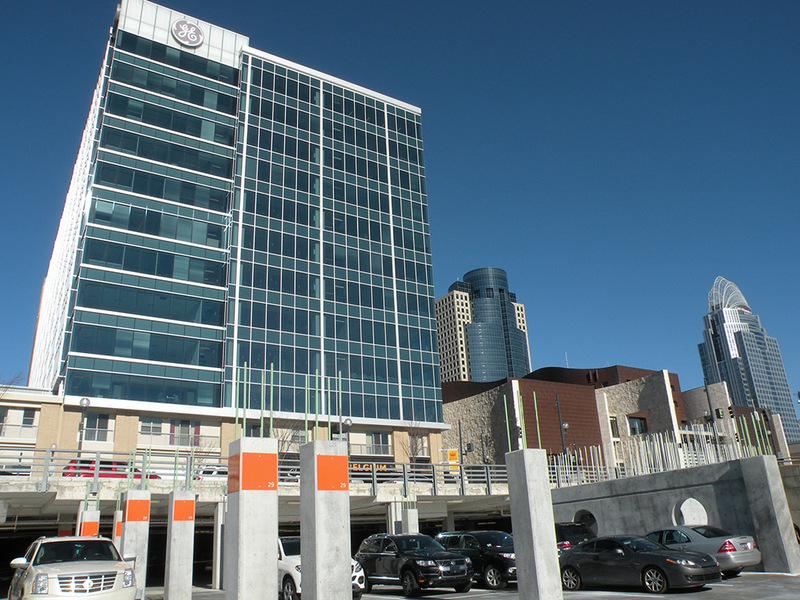 The former sprawling sea of parking spaces has been expanded and efficiently enclosed, creating a transit center and over 4,450-space parking facility to offer ample parking for residents and visitors to the riverfront for work, for dining, for entertainment, and for daily living. With groundbreaking in 2008, this first phase of The Banks opened to residents and commercial tenants in 2011. 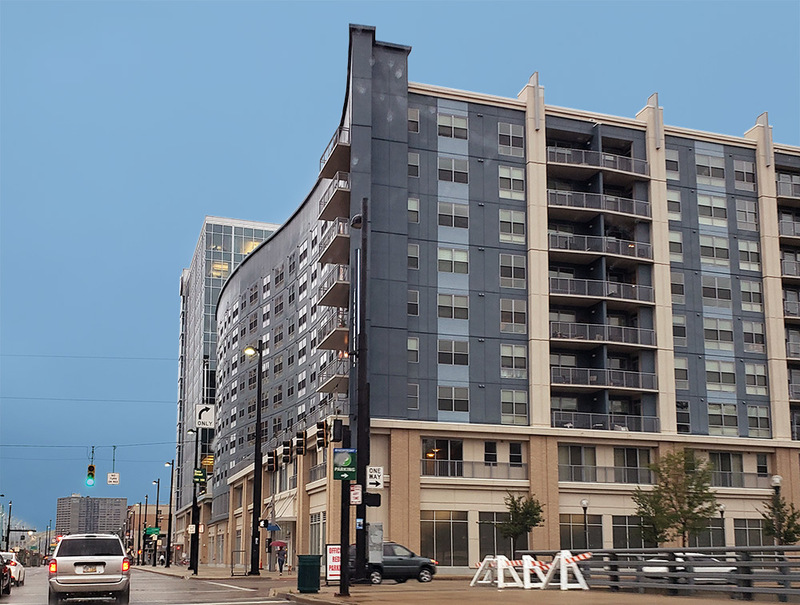 More than 300 residents now occupy Current At The Banks, the first phase of mixed-use structures including rental apartments and nearly 100,000 square feet of dining and entertainment options. Phase I’s owner is Nicol Investments. Apartment leasing is handled by Village Green, while commercial space marketing is handled by CBRE, with tenant management by Jeffrey R. Anderson Real Estate. Marriott’s 171-room AC Hotel opened in 2017.